A few months ago I was on a call with a church-planting coach. We, Two Cities Church, were coming up on our One Year Anniversary and my coach had a few insights into what year two may look like. As always with any coach, there’s a good amount of encouragement and then a warning or a “Hey, you should probably be prepared for (fill in the blank).” I should know to expect it by now, but it always throws me a little off. Those who have gone before us know a bit more about the process, the trends and what to expect than we do. Who is on the bus that needs to move? Who needs to get off the bus? If you had to remove one person from the team, who would it be? Talk about questions you don’t want to answer! Geez! But that’s the hard work of leadership. All of this has forced me not to just accept that this sort of thing happens as you head into year two, and probably continually, but I want to know why this happens. So, I’ve been working on this theory and it is a working-theory. 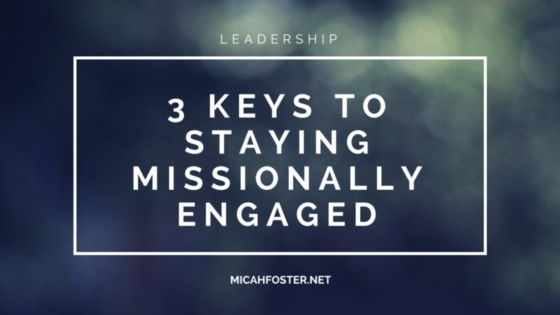 I don’t have a great name for it yet, so let’s just call it: The 3 Keys to Staying Missionally Engaged. I’ve recently had the opportunity to bounce these keys off of other church planters who are farther down the road than we are and their experiences have been very similar. So, I want to share these and hope it helps. While there are tons of different reasons people need to take time off or take a step back, I’d like to offer three things that I believe every staff person or volunteer needs to stay missionally engaged in the church. Inviting and seeing people come and get involved; Being in a small group and watching other people grow; Being personally connected to someone who is getting baptized or recently gave their life to Christ; Serving on or Leading a team that is winning; etc. Growing in your own personal relationship with Jesus; Developing healthy habits; Surrendering previously un-surrendered areas of your life; Becoming more Self-Aware; Working through hurts, habits and hang-ups; etc. Involved in a community group (small group) or strategic service team that loves each other; Feeling cared for or caring for someone when life hits the fan; Gaining support from people in times of high stress or personal tragedy; etc. I know there are other factors at play, external factors like having a baby, changing jobs or job loss, stress at home, health issues and more. But these principles, when applied over the lives of your leaders, will help you see where they’re at and how engaged they are. When you feel distance coming between your team and the mission, ask yourself if they’re experiencing these 3 things. If not, try to help them head it off before you’ve come to a point of crisis. I hope this helps you as you engage your key volunteers and staff. If you’re looking for ways to keep yourself from burn-out, check this blog post and podcast from Carey Nieuwhof’s interview with Craig Groeschel. These photos were from our One Year Anniversary after party. 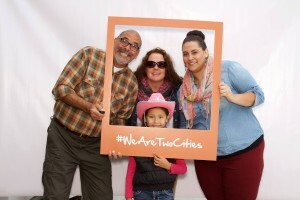 See more Photo Booth pictures from our One Year Anniversary here. After one year, a lot of heartache, ups and downs, changes in our team, changes in the faces that volunteer and attend and more… I continue to say, “It’s Worth it.” It being church planting that is FOR our community and the people in our community. But here’s the thing, it’s worth it because Jesus said with his actions, “You are worth it.” When he spoke to people the religious leaders avoided and he forgave people who didn’t deserve forgiveness and he taught and healed and loved… he communicated that each person, each individual is worth it all. And ultimately, when he died a gruesome and embarrassing death, he did that to pay for the sins of each “worth it” person. You and me. When I say, “It’s worth it” — it’s worth it because of the stories depicted in the video below, and many more untold stories that have arisen within our community at Two Cities Church. I know I’m right where God wants me and I can’t wait to see what he does in and through Two Cities Church in our second year. 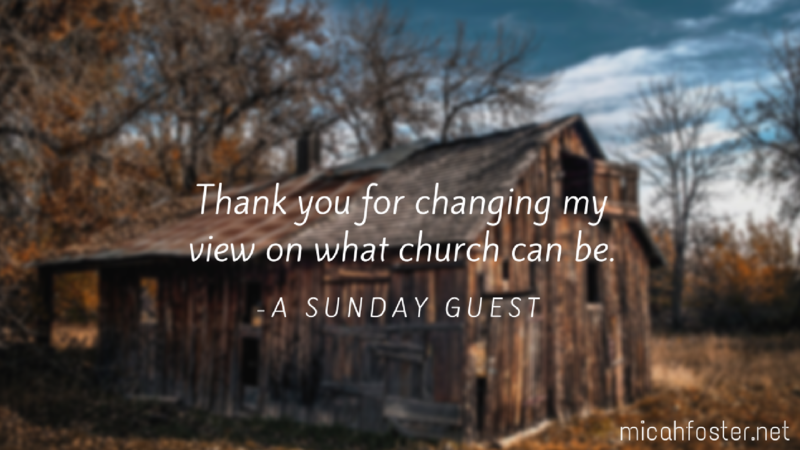 The following post is part of a series of guests posts from people involved with Two Cities Church. 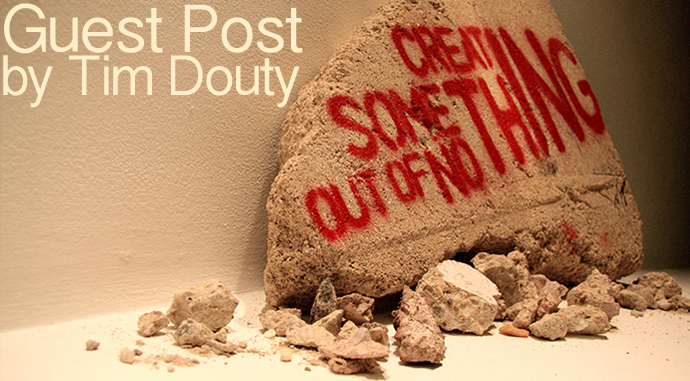 This post is written by Tim Douty. Tim is one of our group leaders, our band director and he is also on our board. Tim recently emailed me some thoughts and I asked him to expand on those thoughts and write a guest post for my blog. Thankfully, he agreed. Enjoy. I’m not sure if I ever imagined I’d say that about us, but I suppose that’s what you call it when you start a new church. A couple years ago, we, along with some close friends, felt a nudge or heard a call or sensed something – whatever phenomenon you want to call it. It was a moral imperative for us that could not be ignored. Start this church. So about two years ago, we started meeting and getting people together around a specific vision. You see, we weren’t just going to start another church in Fresno and Clovis. These two cities that I have called home all my life do not need another church. They are filled with hundreds of great churches. I met my wife in one of these great churches. These churches are reaching people and helping people grow and they are making a difference in our community and around the world. We are not seeking to duplicate them or replace them. These cities need a different kind of church. 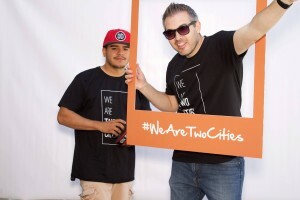 We call this place Two Cities Church because we are for these two cities of Fresno and Clovis, as well as the whole Central Valley. We have friends and family members – names and faces of real people – that we want to introduce to Jesus. But these people are not currently attending church or they have had bad church experiences or have simply found organized religion irrelevant. These are who we want. We want the rejects, the down and outers, the underdogs. We want the imperfect, the have-nots, the ones who don’t have it all together. 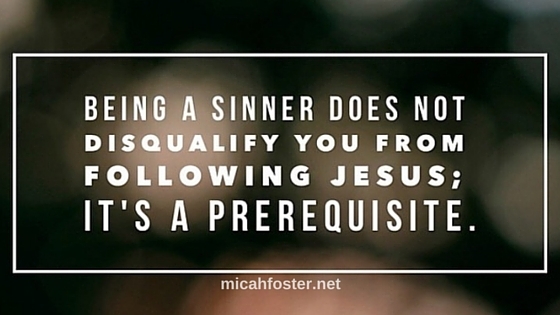 Because Jesus is for everyone. This is a daunting task for several reasons. In the traditional church world, most churches are planted by other churches. One church either outgrows its facility or wants to expand their influence so they get a group of people together and they send them. 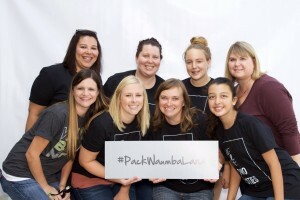 They put together volunteer teams, financial support, and they plant the new church. Well, Two Cities is different. No one is really sending us. We have not received a massive influx of cash or volunteers or attenders to start this thing. We are starting from scratch. We are starting this church from nothing but the vision God has given us and the relationships we have. We are sustained only by the people who give to the church and attend each month at our services and by those who come to our small groups. That’s it. It’s a daunting, and at times lonely process. After reading this, I immediately thought: that’s us. That’s Two Cities Church. There was nothing, and then, through a vision that God gave us, suddenly there was something. I also immediately thought of people I know who have experienced this amazing characteristic of God’s character in their own lives. I have seen God bring dead things back to life. I have seen marriages that were dead that God resurrected. I have seen futures given new life after it was believed they were gone forever. We have seen dead relationships with siblings and friends revived. We have seen families created from noting. We have seen impossible diagnoses miraculously healed. We have seen lives that were dead turned around by the incredible grace of God. And we have seen God take nothingness and turn it into something incredible. We are Two Cities Church, and in this phase of growing, praying, waiting, pressing in, we know that at the same time we are in the exact center of God’s will for us. Because the God we serve is a God who makes something out of nothing, who takes dead things and gives them new life. He did it for me, he’s doing it for many others, and he’s doing it through Two Cities Church. Stacy and I worked together at a local church several years ago. She was always helpful and supportive as the communications specialist on staff there. Allison, 14, has been a great volunteer and she perfectly expresses the vision of Two Cities Church in this month’s #WeAreTwoCities video. I’m so glad that they have jumped on board with Two Cites and when I ask myself the question, “What would go undone if Two Cities didn’t exist?” – These are the stories that keep me going. I hope you enjoy watching the story of Stacy and Allison. Meet Dennis and Bev Wyman. We showed their story this past Sunday at Two Cities Church. Dennis and Bev are a vital part of our team at Two Cities Church. Bev volunteers in the Children’s Ministry check-in area and Dennis serves on our Guest Services team. In addition they are a part of our Monday evening Launch Group at my home. Meet Donny and Amy. We showed their story this past Sunday at Two Cities Church. Donny and Amy are a vital part of our team at Two Cities Church. Amy volunteers as a small group leader for 2-year-old kids in Waumba Land and Donny serves on our Service Programming Team running our graphics for the screens. Here’s a quick update last post on our end-of-year Step Up campaign. Let me remind of you our goals for this campaign. But here’s the deal. We don’t need the money to sustain what we’ve been doing. We’re not in maintenance mode. We want to step up the implementation of our mission and vision. 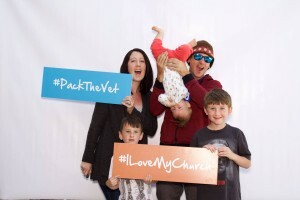 To lead people into a growing relationship with Jesus Christ by creating a church that unchurched people love to attend. Hire a Service Programming Director – The person in charge of the adult worship experience from the parking lot to the stage. Pay off the credit we owe to our credit card, due to the purchase of our equipment and trailer. Pay for our December events (KidStuf Christmas Edition and Christmas Night of Worship). Give us a little margin entering 2014 for the unexpected expenses we’ll face. Open UpStreet (K-6th grade environment) – in January we will have a BETA version open! So, here’s how you can help us reach our goals for this campaign. You may think, “I can’t afford much, so it’s not that big of a difference.” Every penny matters, every act of faith is significant. When you give, you’re not just saying, “I want to support this.” You’re saying, “I trust God to do something significant with this.” It’s an opportunity to grow in your relationship with Jesus… which is accomplishing our mission. Let’s Step Up together so that Two Cities Church can Step it Up! The life of a church plant goes through many phases or steps. Here are just a few, off the top of my head. A person or collection of people feel a call, pray about it, seek counsel and explore the options. A person or collection of people make the final decision and begin to talk about it with a selective group of people. A team of people begin to form around the call to build that church. I’m not talking about a physical building, I’m talking about a body of people. That’s what the church is… a body of people. That team begins to hold small gatherings of interested people to share the vision. That team begins holding semi-regular “glimpses” into what the church services will be like. (This is where we are at) Those glimpses increase in frequency over time, as cash-flow increases. That team and the people who have come around the vision of the church start “every-week” services. The years and decades to follow impacting the community, country and world. This probably isn’t every church plant’s story. But it’s ours. I’m getting comments left and right from people who have come to our services saying these three things. I love Two Cities, it feels like home. I just wish it was every Sunday. We’ll be there when the elementary environment (UpStreet) is open! The amount of people giving a consistent amount every month needs to increase by at least $4,000 a month. In addition to the increase in monthly giving we have a goal of raising an extra 10K at the end of 2013. That money will be used to pay the last couple grand owed for our portable church system (credit card), various insurance plans we’ve recently started, events we’re holding in December and give us a little margin with which to begin 2014. The amount of people serving needs to increase. As we grow, we need to continue to create small environments, groups, that meet in living rooms. Investing in the people around us and invite them to come to a service or event. So, how can you help? Take one small step today. Give regularly online, let me know you’d like to serve on a team, join a group in January and invite everyone you know to come and see what Two Cities Church is all about.